We have received unconfirmed reports that at least one of the men pictured will be facing charges. We now believe that these photographs were taken in Daegu and we are still looking for information about the warehouse where this took place. We believe that the company that owns the warehouse should be held responsible for this cruelty as well. If you have any information about the warehouse, the company or its owners please contact us immediately. PLEASE SHARE! These men were photographed hanging and torching a dog behind a warehouse. The picture reveals the driver’s license plate and Korean logo of the company’s warehouse. Please help us find the company and the people behind this horrible slaughter. 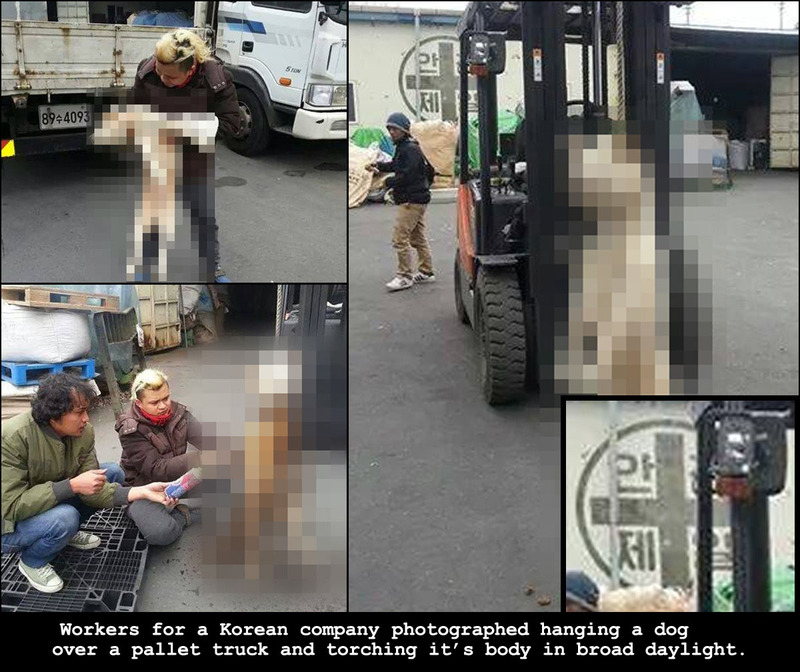 The Korean government must be called upon to punish them for the illegal hanging and torching of the dog. According to the names on facebook they are known as Maklan Sinden and Catur Malenk. Investigators were able to trace the business location and men responsible for the hanging and killing of the dog. Police were able to trace the truck to a business located in Dongsu, Naju in South Jeolla Province, which used to hire Wahyudi. Regardless of your position on the dog-meat trade, torturing and slaughtering dogs out in the open like this is illegal. In this case, we hope that the Korean government will treat this as a serious crime and not overlook the fact that the Korean company involved should also be considered in violation of Animal Rights Laws in Korea.